Nandi Mngoma's post on Instagram. It seems the only way we can find out about Mzansi weddings lately is if we pay attention to the subtle hints couples throw at us. 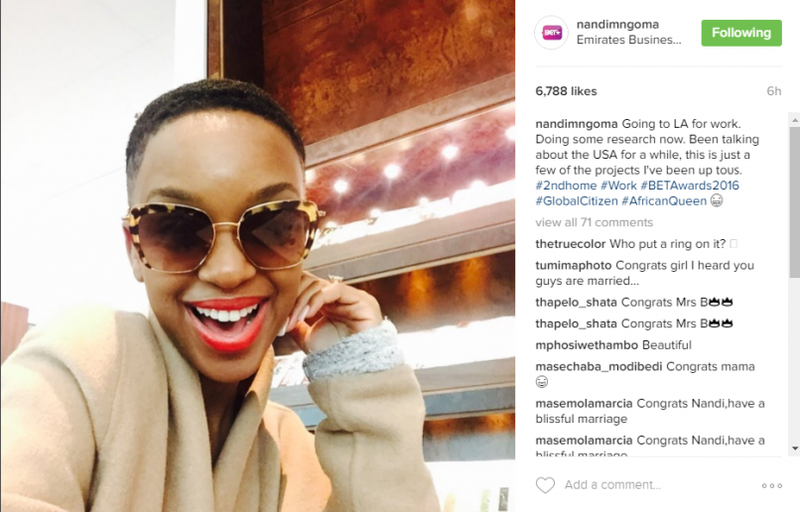 Model and songstress Nandi Mngoma posted a picture of herself on Instagram looking gorgeous, as usual. However, it was not her haircut or stylish shades that got her fans excited, it was the big rock on her ring finger that got people asking if she had married or got engaged to her long-time boyfriend Zakes Bantwini. Mngoma has been talking about going to the US for a while now, and it seems that has finally happened, as the Skhanda Love hitmaker said she was going to Los Angeles for work – for the BET Awards. We are not sure what exactly she will be working on at the awards, but it seems Mzansi will be well represented, as Cassper Nyovest, Black Coffee, Kiernan Forbes and Emtee will be joining her. Anyway, coming back to perhaps one of the most secretive couples in celebville, Bantwini posted a picture of Mngoma on Wednesday as his Woman Crush Wednesday, and the ring was nowhere to be seen. So it is possible the couple pulled another Pabi Moloi on us and got married on the weekend. It seems secret weddings are becoming a thing these days. First it was Mi Casa’s J’Something, who paid lobola and threw a traditional wedding and kept it a secret for a while. Then came Hlubi Mboya, who got married to her Scottish husband Kirsten Arnold. The couple threw a beautiful, culturally integrated wedding, with Hlubi in her Xhosa traditional attire while Arnold in his Scottish kilt. Another couple that might have jumped on the secretive wedding train is former Miss SA Bokang Montjane, who may have secretly got married to her long-time partner, Kaizer Chiefs captain Siphiwe Tshabalala. Congratulations to these couples – married or not – we wish you a long and happy life of marital bliss (or whatever it is)!